Looking for a fun craft that will develop fine motor skills, provide practice for patterning and make noise? Check out this great DIY tambourine tutorial! During the summer we really enjoyed the Michaels Create Camps offered at that wonderful craft store. I signed the kids up for every single session and they had an absolute blast! I loved that they got to create and I didn’t have to prep or clean up! I also got to wander around Michaels for half an hour or so, a few times a week, which was super fun, but not so great for my wallet! The classes are organized by age (3-5 and 6-12), which assumes ability and independence level for each craft. I put my guys in the younger sessions, simply to ensure independence and confidence since it was really the first time they had ever attempted a class without me. As I said before, they had a blast, but on one particular occasion, they were a little disappointed that they weren’t making the big kid craft. That craft, was these awesome tambourines! So, like any good mom, I scoured the store in search of the supplies to make them with the full intent of crafting with the kids the next day. The next day we were distracted by some other activity and the supplies got shoved into the cupboard and forgotten about. Until one day, I decided to do an unplanned craft with the kids, and looked in the cupboard to see the supplies. I was super excited to make them with the kids and they were even more excited. Until it came time to actually make them. That part, took a lot of work, and I instantly realized why they were the activity of the bigger kids that week. Nevertheless, with a little (or a lot) of guidance, direction and help from mom, the kids ended up with these gorgeous tambourines. The supplies necessary are pretty easy to find on Amazon, at any craft store and some can even be picked up at a dollarstore! Once you’ve gathered your supplies, you are ready to get started! The Embroidery circles I picked up at Michael’s actually had two circles attached to each other, so I just popped out the middle ones and kept the outer ring for a later craft. To begin I had Nathaniel choose a colour of yarn and then cut a long string of it. Then I tied it to a random part of the circle with a basic knot and then pinched it to the circle with my thumb and forefinger. Using my other hand, I wrapped the yarn around the circle, tightening the string flush to the wood of the circle. I continued doing this until I reached the end of the yarn piece. Once I reached the end of the first colour, I had Nathaniel choose the next colour and snipped a long string of it. Then I tied the end of the new colour to the end of the first colour and tied it with a simple knot. As you can see from the picture above, there was a bit of a tail coming off the yellow (first colour) when I tied it to the red (second colour), so I lined the two tails up under the circle and weaved the red over top of the tails thus hiding and securing them to the circle. From there I continued weaving the red yarn onto the circle until I reached the end and then began the process again with the next colour. I did this until I reached the very end of the circle. Once I reached the end of the circle and had all of the wood covered in yarn, I gently lifted the first wrap of yellow (the first colour) and slipped the blue (last colour) yarn underneath and through. Then I tied the blue together securing it in place and then snipped off the extra yarn tail. This is quite lovely once all the yarn is in place and secure. But there is still more! 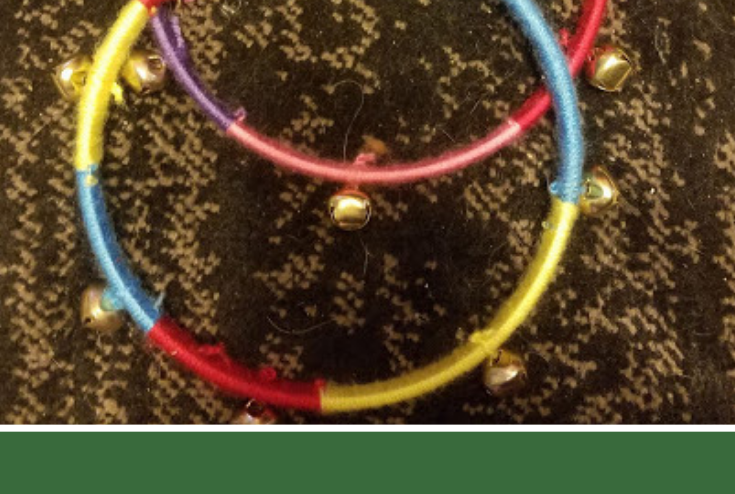 The next thing I did was cut small pieces of string to attach the bells to the tambourine, so it could actually make noise. I cut a string for each colour section, although you could add more or less depending on your preference. Once I cut the yarn, I simply threaded it through the bell eyelet and then tied it to the appropriate colour section with a simple double knot. Once I tied all of the bells on and made sure they were tightly secured, there were all sorts of fun threads hanging off. I chose to cut them off, but you could certainly keep them to add some character to your tambourine! And voila! A beautiful, jingly tambourine for you and your kids to make music with! I did find that overly aggressive banging would sometimes cause bells to fall off, but it is pretty easy to fix with a new piece of yarn.